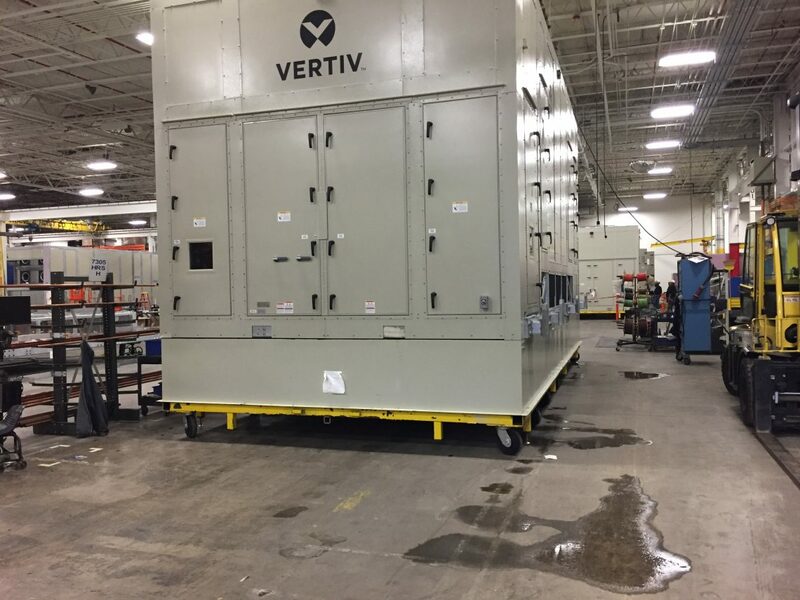 An air conditioner manufacturer had long relied on Conveyer & Caster for the best cart casters to move their cooling units during production. Most of the units —typically used in data centers for the IT industry — were 2,000 to 5,000 pounds. That’s heavy, but still easy enough to push or tow around the plant. The heaviest unit was about 10,000 pounds. Our heavy-duty cart casters successfully kept that product moving too. Then came a new challenge. In 2017, the company received an order for a 20-foot-long, 15-foot-wide, 15-foot-tall unit — the largest cooling system they had ever produced. And the customer wanted 17 of them! The company again turned to us for help sourcing the best casters to efficiently and safely move units from the plant to the shipping dock. There they would be hoisted onto a truck with a pulley system. The units were estimated to weigh 30,000 pounds each, three times the weight of the heaviest unit to date. We had the right caster, an Albion® 410 series rig that could handle up to 5,400 pounds. With eight casters per cart, the 410 series would work well. At least it could work well. Selecting the right quantity of the right-weighted casters is essential. While basic carts share the load among four wheels — one at each corner — carts that carry wider, heavier or taller loads require more wheels in order to create a steadier base. Unfortunately, the casters began to fail under too much weight. We realized that, due to concrete floors that weren’t level, all eight casters weren’t touching the floor at the same time. We recommended adding more casters to better accommodate the uneven surface and share the load. Uneven floors don’t necessarily spell trouble for carts as long as they have enough casters, strategically spaced, to carry the load when all wheels aren’t touching the floor. When choosing casters, consider characteristics of the floor. Is it level? Is it covered with debris? However, failures continued — until the customer realized that the product weighed nearly twice what they had thought! At 53,000 pounds, the unit clearly required a cart with more and different casters for heavier loads. We recommended the Albion 610 series, the same Albion Trionix™ high-impact polymer wheel that the customer preferred but with rig strength up to 7,200 pounds. Identifying accurate weight is necessary for selecting the right caster. Always factor in extra weight as well, as a safety precaution. Today, each cart has 17 of these super-strong casters. In the two months since they’ve been in use, the customer has reported no issues. Finding the right caster solution took about three months, but the customer trusted Conveyer & Caster to steer them to it. Even when applications are still in development, Conveyer & Caster is ready to collaborate with customers and help them overcome challenges as they arise. As we piece together details — including load and floor conditions — we can provide the best casters for the job, no matter how big.